Hubby and I are currently in studying again...in a school for parents, that is. 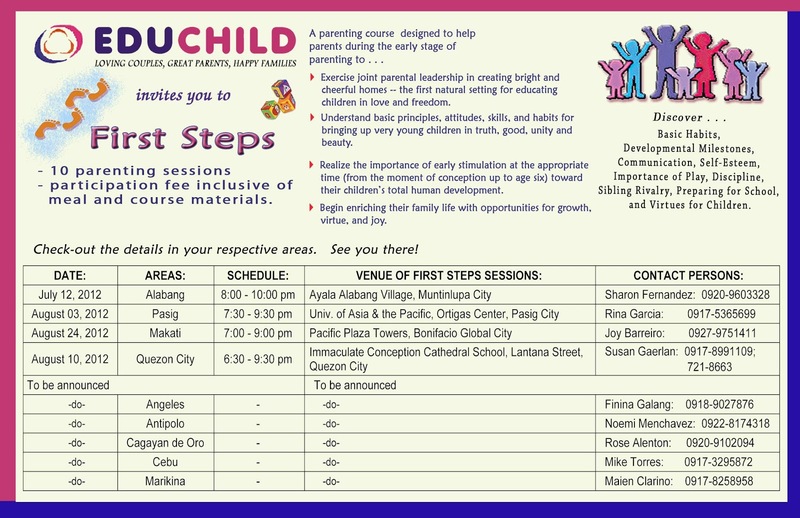 We had enrolled ourselves to Educhild's First Steps, a program that will teach you about parenting (for those with kids at 7 years old and below). The approach is through case methodology and is really very helpful for us. In addition to that, there are other couples there that we can share notes with and that really adds to the value of the course. The icing on the cake is that we might even earn new friends! 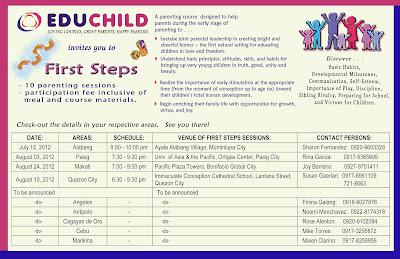 In the end, what we will derive into the discussion are stuff which we can apply in our personal day-to-day "struggles" as parents. And for that, the 10 Saturdates which we've invested is all worth while. I leave you with the brochure. Bye-bye for now, I gotta go and look into wireless fencing for dogs for my friend who recently got a pet dog.